The 8 foot bronze statue of Benjamin Franklin standing in front of Boston's elaborate French Second Empire-style Old City Hall looks new. 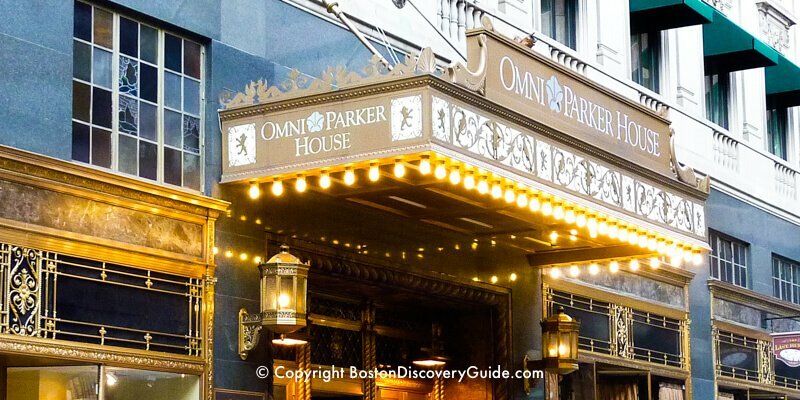 However, this elegant statue of this famous native Bostonian and American statesman and inventor has graced this location since 1856 - the first public statue of a person erected in Boston. Not many traces remain of Franklin's life in Boston - but if you look behind the statue to the left, you'll get a glimpse of an older area that Franklin himself would have known well, the King's Chapel Burying Ground. As a site on Boston's historic Freedom Trail, the Benjamin Franklin statue celebrates one of Boston's most famous native sons of the 1700s - and a key creator of the documents defining American democracy. Born in Boston in 1706, Benjamin Franklin was a printer, publisher, political thinker, scientist, writer, inventor, civic leader, statesman, and diplomat. After winning a seat in the Philadelphia Assembly, he actively participated in local politics - and in the creation of his soon-to-be new country. Although well up in his years by the time that the American Revolutionary War began, he served in the Continental Congress and later as the country's Ambassador to France. As part of the process of ushering in American independence with its guarantees of liberty and justice, Franklin spoke out strongly in support of the abolition of slavery and protection of Native American rights. Ben's father hoped that he might become a clergyman, so he sent Ben to nearby Boston Latin School (then called South Grammar School) when he was 8. Family finances forced Ben to drop out within a few months - perhaps Boston Latin's most famous dropout. After a few more months in another school, he left school forever at age 10. Following a brief stint in his father's candlemaking shop, Ben apprenticed to his older half-brother James, who ran a print shop and soon started his own newspaper, The New England Courant. Ben quickly learned the basic skills of the trade. He set type by hand and sold newspapers and books on the street. When James's political satires offended the conservative Massachusetts General Court, the Court threw James into prison a couple of times. During his brother's absence, Ben used his new-found skills to run the newspaper and continue to turn up the political heat under the Puritans, refusing to bow to pressures exerted by the government. By the time he reached 16, Ben aspired to be a writer but believed James would never knowingly publish his work. Why Did Ben Franklin Leave Boston? To get published in his brother's paper, Franklin created a fictional widow, Mrs. Silence Dogood. Boston citizens easily recognized her name as a direct satire of Puritan Minister Cotton Mather, who expounded on his ideals in his "Essays to Do Good." Ben began writing "letters" late at night, signing them with Mrs. Dogood's name, and slipping them under the print shop's door. James printed them, and they became wildly popular, amid much speculation about the real author. After writing 16 of them, Ben confessed. James' friends praised Ben as being incredibly witty and insightful - but James was not amused. In fact, James became so envious of the attention given to his half-brother that he beat Ben periodically and they quarreled constantly. Sadly for Boston, Ben left for Philadelphia a year later at age 17, fed up with his abusive brother and Puritan Boston. 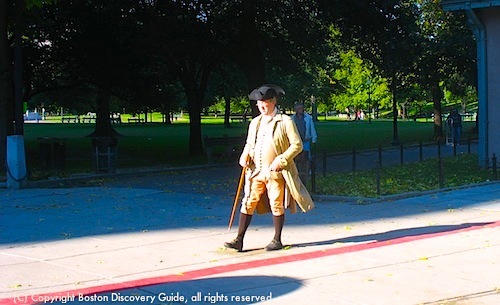 Most Freedom Trail Tours usually pause for photo ops in front of the Ben Franklin Statue, and guides often provide interesting commentary about his life in Boston. Sadly for Freedom Trail walkers, you won't really see any tangible artifacts from Franklin's actual life in Boston. 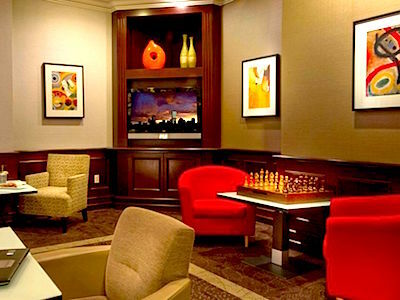 Most of what we know about his early days in Boston comes from his Autobiography, written much later in his life. 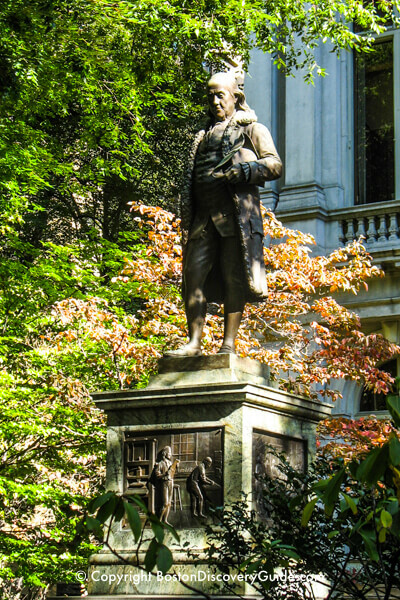 The Benjamin Franklin statue in front of Old City Hall was placed there nearly a century after his death. The small house on Milk Street where he was born and raised is long gone. Likewise, his brother's print shop at 17 Court Street no longer exists, although you can see see a bronze plaque on the outside of the current building. If you notice the large marble obelisk in Granary Burying Ground with the Franklin name on it, you may think that Ben is buried there - but he's not. The marker is a memorial to his parents. 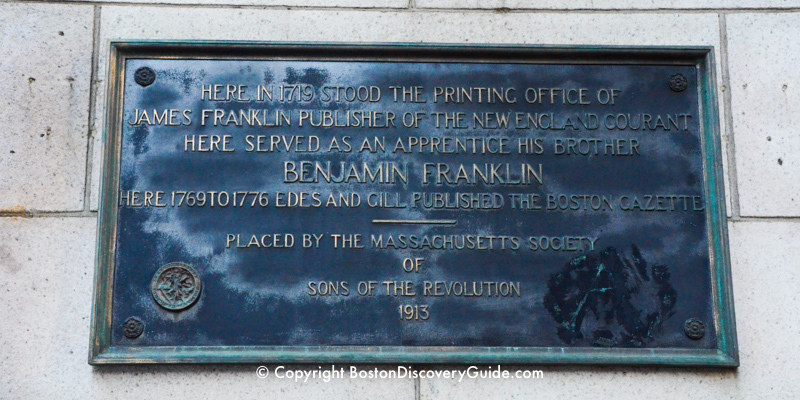 But what you can find, if you're a Ben Franklin fan and want to get a glimpse of his life in Boston, are other sites along the Freedom Trail that he'd have walked by, perhaps on a daily basis, back in the early 1720s. On the day of his birth in 1706 in a 2-story cottage at 19 Milk Street, the 15th of 17 children, Baby Ben was taken across the street to be baptized in Old South Meeting House. As a boy, Ben might have been present for burials at Granary Burying Ground or King's Chapel Burying Ground. Perhaps he joined his family and neighbors for one of the popular forms of entertainment in Puritan Boston: attending public executions on Boston Common. And he most likely would have watched the building that we now call the Old Corner Bookstore at the corner of School and Washington Streets being rebuilt in 1718. 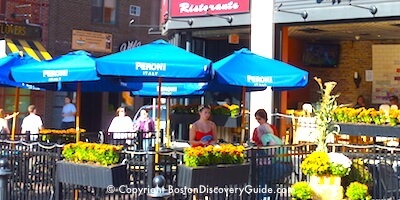 Unfortunately, the Benjamin Franklin statue and its immediate surroundings don't really tell you anything about Benjamin Franklin's life in Boston or what Boston, with its population of 5,000, was like when he was born here. 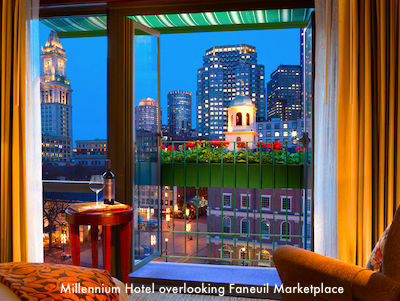 If you have only enough time for a few Freedom Trail sites, you may not mind skipping this one. 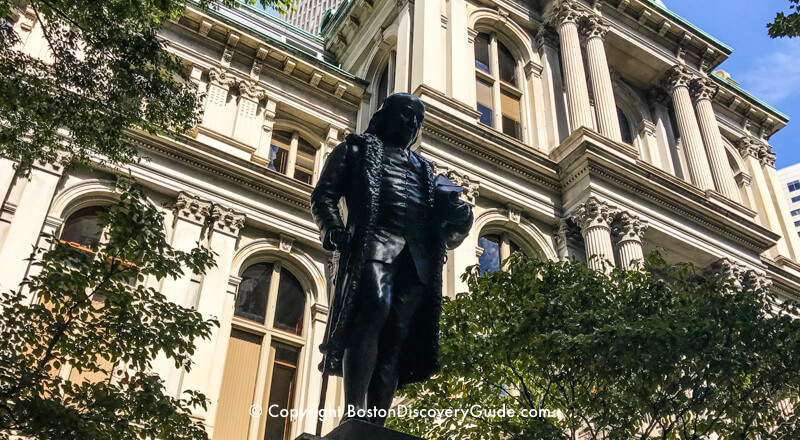 However, the attractive tree-filled courtyard where Benjamin Franklin statue is located in front of Old City Hall is a favorite photo-taking spot for Boston visitors. 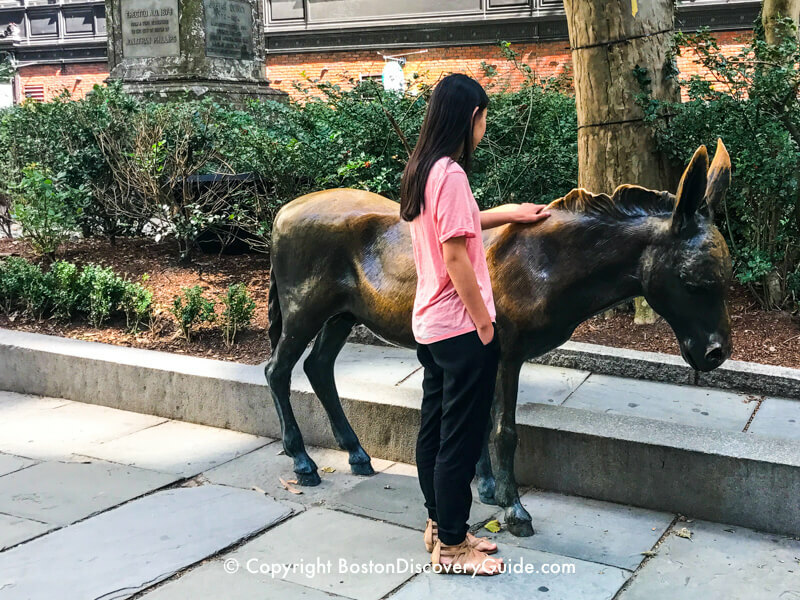 If you're visiting with young children, they'll enjoy climbing onto the small bronze statue of a donkey representing the Democratic Party on the other side of the sidewalk. Near the donkey is a bronze plaque with footprints that says "Stand in opposition." On the sidewalk along School Street, look for a colorful inlay commemorating the Boston Latin School, which now exists in a different location in Boston's Fenway neighborhood. Unless you linger while taking pictures or letting your children sit on the donkey, you'll probably spend only a couple of minutes at this site.